The photo above shows a clump of purple milkweed (Asclepias purpurascens) near the end of my driveway. I fell in love with this species from a photo at a plant lecture about 10 years ago. I couldn’t find plants for sale at the time, so I imported seed from the only source I could find (in Britain), and failed to get it to germinate. About five years ago, I finally scored the three plants that make up the current clump, got them established, and congratulated myself heartily. My smugness lasted only a year or two, when I realized that several plants of purple milkweed were already growing in the hedgerows on my parents’ farm next door. 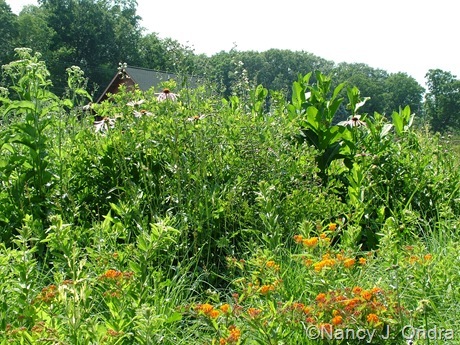 Then last year, I found quite a few established plants growing in my own meadow out back. 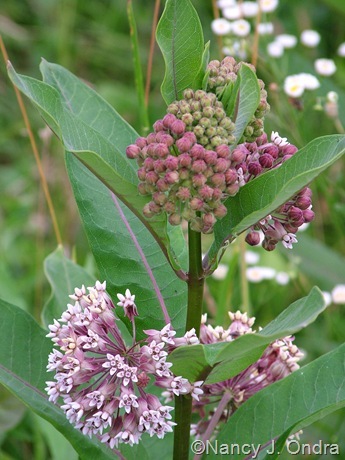 I knew well that the meadow was already home to several large patches of common milkweed (A. syriaca), because those plants are hard to miss: they’ tall (to about 5 feet, instead of the 3 feet of the purple milkweed), and all parts of the plant are somewhat larger. Common milkweed is also distinctive for its vigorously spreading habit, which is fine in a meadow but a problem in a bed or border. I’ll note that my three original plants of the purple milkweed have been growing in one spot for about 5 years now, and they’ve shown no sign of creeping, nor do those growing in our meadows and hedgerows. 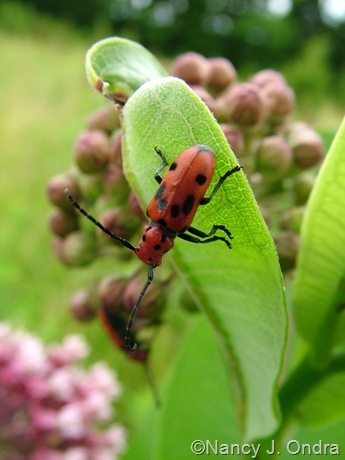 So if you’re thinking of adding a milkweed to your garden, A. purpurascens would likely be a better choice than A. syriaca. 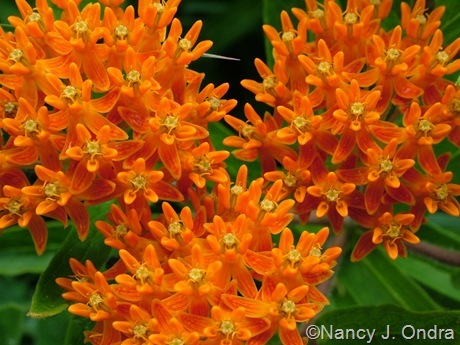 Butterfly weed (A. tuberosa) is another species that’s garden-safe, in that it’s a clumper instead of a spreader. I’ve seen it growing wild less than a quarter-mile from here, but I think the soil right here normally too wet for it. 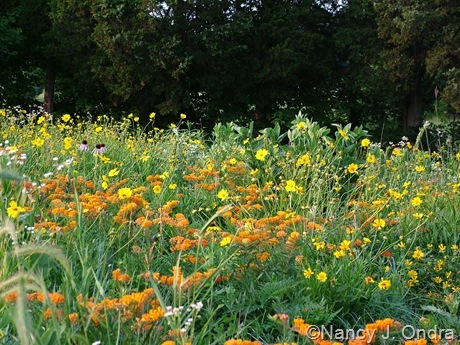 It does grow happily in the meadow mix that I sowed on my sand mound (aboveground septic drainage field), however. The gravelly substrate and raised position seem to suit it very well. 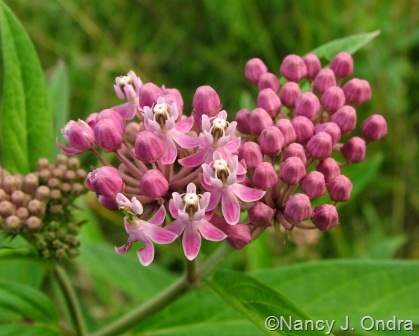 Another well-behaved species that grows naturally in my meadow is swamp milkweed (A. incarnata), in various shades of pink. I haven’t tried to grow this one in the garden here, but I remember having the white ‘Ice Ballet’ in my previous garden and delighting in the sweet scent. 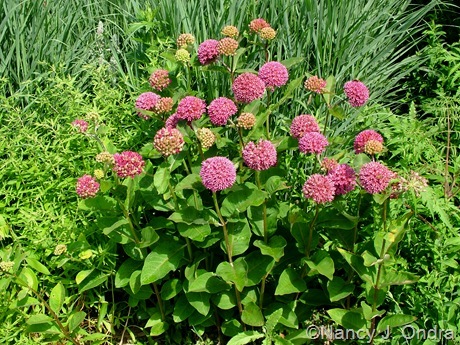 Swamp milkweed usually starts blooming about a month later than the others, though, more toward mid- to late July. 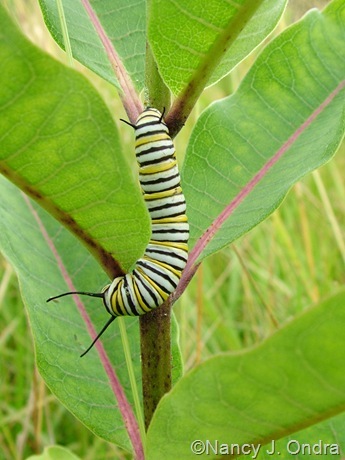 …and, of course, the larvae of monarch butterflies. And that brings me to a question maybe some of you can answer. 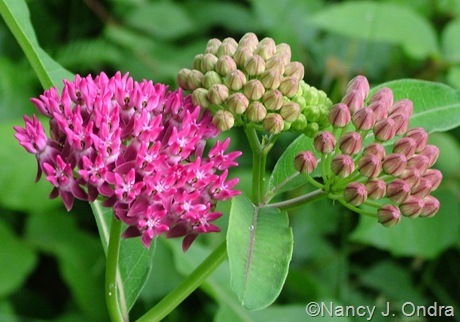 It seems to me that within the past few years, I was at a native-plant meeting where a speaker claimed that we should not grow milkweed species that are not native to our region. 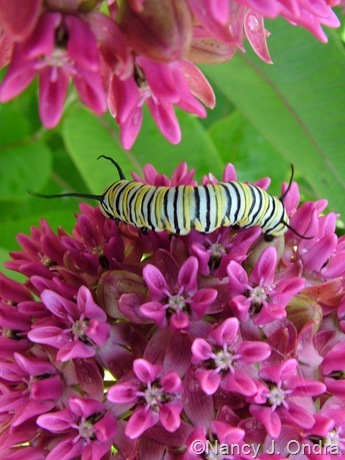 I believe the reasoning had to do with the various milkweed species differing in the amount of the toxic compounds that make the larvae unpalatable to other critters – that if the monarchs fed on non-native species, they might not get the needed protection and could be more vulnerable to predators. I know this speaker made sense to me at the time, but I think I must have lost some of the details over the years, because I can’t get my mind around the reasoning now. I’ve found one reference to a non-native milkweed possibly being too toxic for the monarchs (see the March 14, 2003 entry at Our Backyard Observations about tropical milkweed [A. curassavica]), but no warnings about non-natives providing insufficient protection for the larvae. 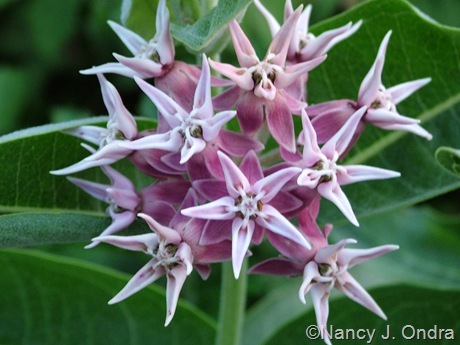 I’d really like to figure this out, because I do remember thinking that I ought to get rid of the showy milkweed (A. speciosa) that I acquired and nurtured to bloom stage. It’s native to the western half of the U.S., but I’m in Pennsylvania, so I figured I’d better remove it, even though the blooms are fantastic. Well, I tried, but this little bugger has very persistent spreading roots, so there are still pieces of it throughout my holding beds. If I can convince myself I’m not endangering the monarchs by moving it to the meadow, I’d love to keep it. So, anyone have any insight on the issue? I don’t think it makes any sense to take out non native milkweeds. Monarchs all over the county use the available milkweed so unless they can prove there are different species of monarchs I can’t see what the problem is. This coming from a non-scientific-biologist type gardener. I didn’t realize there were so many different milkweeds. I am trying for the umpteenth time to get butterfly weed going in our garden. I hope it takes this time. I agree with you in theory, Lisa, but it truly did seem to make sense at the time, so either I misunderstood then or I’ve lost a vital bit of info along the way. Well, I suspect it’s really not that much of an issue for me, because the showy milkweed will probably be popping up here forever despite my efforts to remove it. 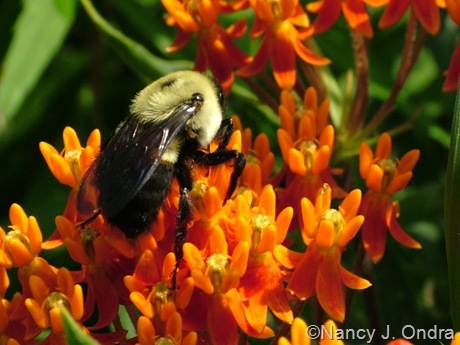 Good luck with your butterfly weed. I think the trick is to not be nice to it, and to pretend that you don’t care whether it grows or not. What an ironic post! I just picked up some orange butterfly weed from my wife’s grandmother’s house. I’m afraid I didn’t get the whole tuber, but I’m hopeful I can get it to grow. I may try some rooting hormone on the tuber to see if that helps. Great photos! I don’t have a clue about the toxicity of non-native milkweed I hope that’s not the case. Good luck with your transplant, Dave. If it doesn’t work, maybe try cuttings, propagation wizard that you are! This is a new plant to me but I loved the photos. I am glad to say that we are less inclined to worry about only using native plants in our gardens. Which is just as well as we have a limited flora and no one really knows if some plants are native or introduced 100’s of years ago. There are non-native plants causing problems in the UK but the US seems to have greater concerns about this and I get the impression that there is a lot of pressure to only plant natives in some areas. Hi Sylvia. I tend to forget that the “native vs. non-native” issue is very different for you in the UK. Mostly I don’t get to obsessive about it; I like plants that look good and grow well together, and their exact origins aren’t so much of an issue. But every now and then, I get on a plant-more-natives, remove-the-exotics kick. Fortunately, the mood usually doesn’t last too long. 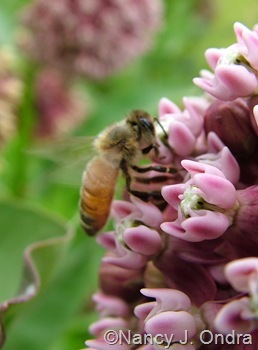 I have some pink milk weed, (Asclepias incarnata), that I winter sowed this year. I do hope it is well behaved. I’m not really a fan of orange but that close-up of the orange milkweed flower is absolutely stunning! I’ve started some swamp milkweed, one is ‘Ice Ballet,’ as well as one called Sullivant’s, native to Wisconsin or round about there. 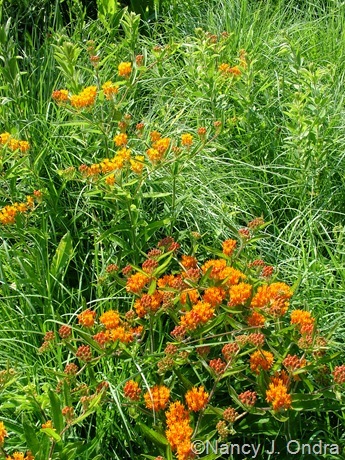 If some folks are having trouble getting butterfly weed to establish, especially in wetter soils, I’ve seen Prairie Nursery has one called a clay buster that can take such soils better. In theory. I’d love to know if it actually grows any better than the usual suspect. Never heard about non native milkweed being a problem, that’s scary, Nan! I hope someone can give us a definitive answer. I Googled the Asclepias sullivantii, and it looks neat: much like A. syriacus, from what I can tell. Interesting about the “Asclepias tuberosa var. clay” from Prairie Nursery, too. As a side note, I found a clump of tuberosa growing one of my wetter pastures last night, several hundred feet away from the sand-mound meadow; I don’t know whether it is a native that I just didn’t notice before or if it seeded in. Unfortunately, it was getting dark, so I mowed over it before I realized what it was. Sigh. Hopefully it will come back. And I’m beginning to think maybe I made up the non-native asclepias problem. Way to go, Nan! As if there aren’t enough things to worry about…. That showy milkweed is awesome, Nan! I (and my monarchs) love my syriaca and tuberosa here. As for the native-v-non-native debate, let’s put it this way: Once a bird has tasted a monarch larva to see if it’s poisonous or not, it’s toast anyway, right? I don’t get all the self-righteous bit anyway, since I know what some of the native enthusiasts plant in their own gardens. Do what I say, not what I do, eh? I think you should grow whatever appeals, and as long as you include natives in your meadow, the monarchs will be just fine. Oh, yes, you’d know about those native-plant enthusiasts and their penchant for unusual exotics, wouldn’t you? And you raise a good point: With so many locally-native mildweeds to choose from, it hardly seems likely that the monarchs will even find my one non-native! Hmm cuttings…not a bad idea Nan! I’m sure you could do it, Dave. Give it a try! I soooo wish I had a meadow, so I could grow a. syriaca in it! As it is, I like to see them (along with angelica–*sigh*) on my drive to work through National Park lands, but it’s just not quite the same somehow. I adore seeing them all in your garden, and can’t wait to see if my a. incarnata ‘Cinderella’ blooms this year. I WS’d it last year from seed shared by Colleen from In the Garden Online, so this might be the year for it. See, the reverse-psychology approach to gardening really does work! I do hope you get to enjoy some blooms on your swamp milkweeds, Kim. The syriaca plants really are neat, but seeing how far and wide they spread in the meadow, where they have to compete with thick clumps of grasses and other forbs, makes them a little daunting from a garden perspective. Hi Nan, thanks for writing about one of my most favorite plants. After several years of struggle, the orange butterfly weed finally germinated and grew. I have had the best luck so far with purchased seeds started in the greenhouse late winter. It takes a few years to get flowers, but worth it. I ordered red milkweed as plants from seed savers exchange and they are finally blooming, two out of three anyway. The drought here is really stunting the growth of all the milkweeds in my garden. The orange color goes especially well with the gaillardia, red monarda and orangey daylilies. Blue fescue cools down the scene and tree trained blue butterfly bushes give some height. As for native or not, I am just going for what will grow and thrive, that’s it. I believe you have the right idea there, Frances, as far as being happy with whatever will grow. We’ve been terribly dry here too (barely 1/2-inch total in the last 4 weeks), and I very seldom water my ornamentals, so I’m definitely at the be-glad-for-anything-you-get mode with them. The regular old orange milkweed hasn’t done well for me here in Austin, but the more tropical Asclepias curassavica grows and reseeds for me and we usually see at least one or two crops of Monarch caterpillars. I don’t know the answer to your ponderings, Nancy, but an article from a California extension office suggests the female butterfly chooses the more toxic plant on which to lay her eggs. Thanks so much for sharing your experience, Annie, and for the link too. I finally had luck getting a nice patch of A. curassavica plants established at work, and I look forward to seeing them bloom through the rest of the growing season, way longer than the tuberosa plants. 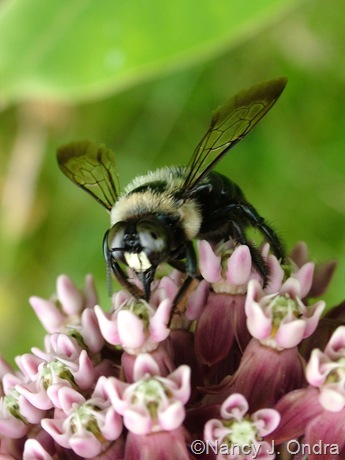 Very nice piece on milkweeds. 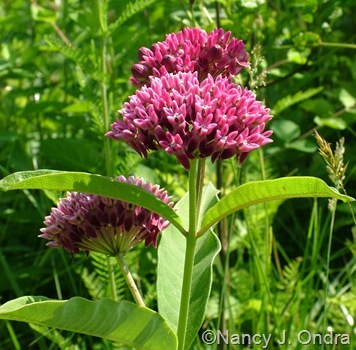 Have you ever looked over Seneca Hills (online) list of milkweeds for sale? I’ve drooled a little over it, but so many of these are quite picky and tricky. Oh, wow, Dan – thanks so much for the tip. The green-flowered species look particularly intriguing. If anyone else wants to check out Seneca Hill’s asclepias offerings, here’s a direct link. Hi Nan! This is my first time here, what a great source of inspiration. 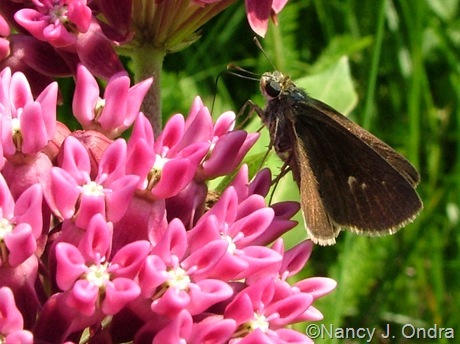 About the native versus non-native milkweeds, alkaloids associated with each milkweed give the butterflies that feed on them protection. If the butterflies didn’t evolve with a particular species, they have no tolerance for that particular alkaloid. 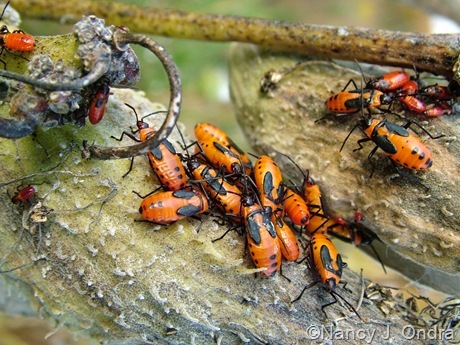 Furthermore, alkaloids from non-native milkweeds can expose them to predation. I’m thinking you’d be fine, since you have some of the native nearby? I’m growing A. syriacus, and have moved it twice. The last time, not quite successfully, as it keeps popping up in its old spot. I’m trying A. tuberosa for the first time this year, but I don’t really care if it takes off or not. Ha! Hey, thanks so much for visiting and commenting, PrairieGirl! I’m so glad to know that I’m not completely losing my memory. If you happen to know where I could read more about the details, I’d greatly appreciate any leads. And um, I’d wish you luck with getting your butterfly weed established, but I wouldn’t want to jinx you. Thanks for checking in again. I wonder if we heard the same speaker? I sure wish I could remember who it was…. Hi there, Bob! Who knows why plants can be touchy for some people and tough-as-nails for others. Part of the challenge of gardening. I’m guessing the issue of native vs. non-native isn’t an issue during migration; isn’t it the larvae that feed on the milkweeds? I see I’m going to be a pest but your sight is so interesting in the topics you’re covering. Speaking of milk weed, I put it in 6 years ago. I have it in my “wild border” and for years until this year it was always in the same spot. Now I discovered three more clusters same bed which is about 200 feet long. It moved and is not in original spot. They are blooming now and not in June as they were in years past. So those are out and the three types of Joe Pye are out and Mondarda etc. My milk weed head is not as nice as yours and the colors is weak this year. Yours is like a pom pom This is the year I see more butterflies of every type than any other year ever. I have tons of Monarchs and other types very abundant at all times since about May. I don’t feel that it will be a problem introducing other strains or flowers and in fact as in my case has helped increase good insect populations. What I would like to rid myself of is the devistating japanese beetle that devours everything in sight! Milky spore didn’t cut it here in Chester for the past two years! You’re not being a pest, Linda; I enjoy your enthusiasm. 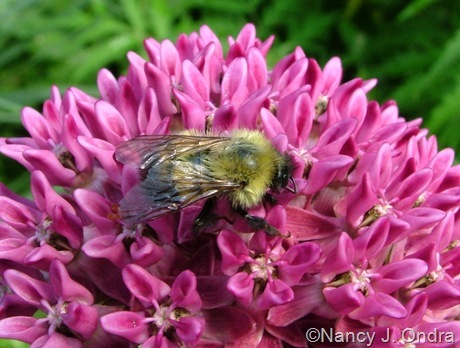 How neat to hear about your experience with milkweeds. Funny you should mention your Japanese beetle problems; I was just thinking that I’ve hardly seen any this year, though they were horrible last year.